This interview took place on: 8/19/13. JFH (Alex Caldwell): As a veteran artist, how much have you seen the world of "worship music" change? Are you satisfied with the current state of worship (as it pertains to music) in the local church? If not, what would you like to see change? Darrell Evans: I have seen worship music come more to the forefront in the contemporary Christian music world. I have noticed that many churches have young, inexperienced worship leaders who are good musicians, have the right look, and are good song-leaders. It seems that worship leaders with some depth, experience, and a pastoral heart are completely pushed out. I was in my late 20's when I became a worship pastor but I had been leading worship since I was 14. I benefitted by having a pastor who was helpful in guiding me as I grew in leadership. It seems that some churches has sacrificed depth for image and presentation. JFH (Alex): You have been making music long enough to remember when drums in the local church were shocking. What other changes have you noticed in your travels around the globe to different bodies of believers? Darrell: The use of video has obviously grown in the last 10 years or so. I think overall that it's a positive thing. I've never liked the idea of perpetuating or playing to short attention spans, but video in worship has seemed to connect with most people. JFH (Alex): What are some of your favorite hymns and favorite contemporary worship songs? Darrell: My favorite hymns are, "A mighty fortress is our God," "Tis so sweet to trust in Jesus," "My Jesus, I love Thee," "Great is Thy faithfulness" and "Redeemer, Savior, Friend." (Had to slip that last one in) I don't keep up that much with contemporary songs anymore because I want my head to be clear when I write worship songs. But I do hear new songs at church. Honestly, some of my favorite songs are a few years old. I like "Mighty to Save," "You are my King," "I am Free" and "God of wonders". I know, not the newest, but still great songs. JFH (Alex): Do you ever struggle with the notion of "making a living" with the songs you have written, or by leading worship in general? Darrell: I believe that worship leading is in effect, a pastoral duty. The New Testament Scripture is clear that someone who gives their lives to ministry should make their living by it. However, I do have to mentally negotiate the issues that come with the music industry marketing and image aspects. In terms of income from the songs themselves, I have no trouble. My theology on songwriting comes from Psalm 45:1. The gift to create and the inspiration needed to create comes from the Lord. The product of creativity--in my case, songs--are the result of the craft of the gifted individual. It is the duty and an act of worship to develop this gift. I believe it is this way in every endeavor for humankind. JFH (Alex): A camp where I recently preached for the week sang "Trading My Sorrows" every night and the campers had these great motions and stomping actions that accompanied the song. What are some of your favorite moments singing that song around the world? Darrell: My favorite memories from "Trading My Sorrows" are actually the many testimonies I have heard over the years of how the Lord has used the song. The strongest being a woman who had a gun to her head in a hotel room turned the television on with the volume on high and saw me singing the song. She dropped the gun, fell to her knees and cried out to the Lord for help. Many people who have gone through difficult circumstances have been encouraged by that song. I'm grateful for that. A favorite from playing the song live was when I saw a section of priests doing motions to the song together. JFH (Alex): What is the story behind that song? Where do you do your best writing? Darrell: "Trading My Sorrows," like many of my songs, began as a spontaneous moment in a live worship setting. During an altar ministry time (at a church where I was the worship pastor) in 1997, I imagined what I would be doing/saying if I were kneeling at the altar instead of holding a guitar. I began to sing the opening lines and the band joined in. The "Yes Lord" part came as we were "amening" all that the Lord was doing in our lives. I then went to my office during the week and wrote the rest of the song, with credit to the apostle Paul. I don't know where I do my best writing because I'm always thinking of/working on something anywhere that I am. I carry several pens, notebooks, and a phone or tab to sing into. Sitting in my backyard seems to work well for finishing ideas. JFH (Alex): How is it to have a large family and travel so much? What sort of steps do you take to plug into a local body of believers? Darrell: It's not easy being away for my family for any amount of time. But because it is part of my ministry and work life, I've determined to be home more than I'm on the road. When I'm at home (which is most of the time), I am home washing dishes, serving breakfast, taking the kids to school, playing with them, and having fun with my wife. My father-in-law is the pastor of our home church and we're very involved there. We've ministered a marriage seminar, women's and men's retreats, and have served in other capacities. JFH (Alex): Do you ever struggle to sit in an audience and sing when you are not in control of the song choices or action on the stage? Darrell: I used to struggle with sitting in the crowd and thinking about song selection, flow of ministry, and the musicianship. I've gotten over it because Jesus is worthy of my worship regardless of any of that stuff. In the end, I should be able to engage in congregational worship if the worship leader is playing the spoons and singing "Kumbayah." JFH (Alex): What are some of your favorite memories of meeting and singing with believers all over the world? Darrell: Some of my favorite memories of leading worship are mostly the nights I was in someone's living room. I started leading worship in home groups and those are still my favorite settings. Being in Harry and Joanne Yates house was sweet. Joanne is Johnny Cash's sister. Leading worship in Brazil was awesome. They knew all my songs in Portuguese. It was so powerful to sit back and listen to them sing in worship. I'm going back next year. I've focused most of my ministry on the U.S. and many times over the years, people have been healed during these worship nights. I love that. Jesus Christ is the same yesterday, today, and forever! I have seen Muslims healed and come to Christ, a Buddhist college student become a follower of Jesus, and an entire coven of witches overcome with the power of the Holy Spirit while they were attempting to disrupt a service. JFH (Alex): Have you ever felt unworthy to get on stage that night and lead worship? 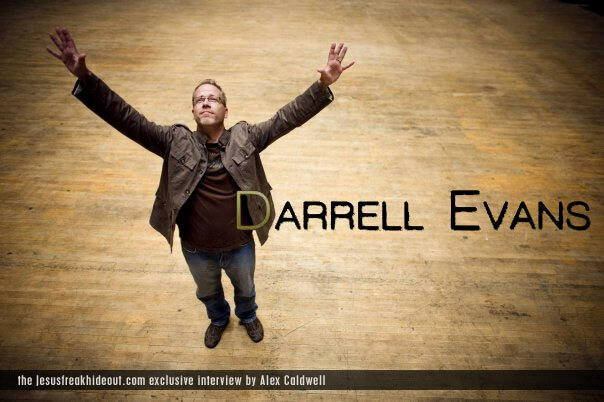 Darrell: I think every worship leader has felt unworthy at one time or another. But God's grace is bigger than our biggest failure. The enemy wants nothing more than for us to be frozen by our shortcomings and stop serving others. I know that I've never been worthy on my own but I am rendered righteous because of God's grace and my response of faith in Christ. If I ever think that my own works make me worthy of anything from God or to serve in any way, I am mistaken. It's only the blood of Jesus the makes me right and the calling of God that makes me confident to serve. JFH (Alex): "Oh What A Wonder" is my favorite song on your new album. Where were you when you wrote that? There is a bit of Bruce Springsteen influence in your vocals for that one -- He is mentioned in your bio on Wikipedia. Are you a fan of his? Darrell: "Oh what a wonder" was written at Fox Trot Studios in Shreveport, LA. I was there doing some demos. While taking a break, I sat on a couch and wrote the song while the tears flowed. It was a sweet moment with the Lord and it's one of my favorite songs. I am influenced by a number of artists. Different songs may bring out different influences. I am a fan of Bruce Springsteen's music but not his politics. Darrell: The music industry has changed quite a bit and isn't done changing yet. Through the changes, I've determined to let other people handle that stuff (marketing, promotion, etc.). I don't like to promote myself anyway. I have continued to just keep doing what I do: go wherever I'm invited and share the life of Jesus. JFH (Alex): What would you like to be said about you when your career is over? Darrell: I will never retire. I will be worshipping Jesus and serving others until He comes again or until I stop breathing. I don't look at what I do as a career that I can retire from. There is no 401K, there is no pension, there is no gold watch. JFH (Alex): I first heard "Let The River Flow" as a teenager at an "Acquire The Fire" youth rally back in the mid 90's. What was it like hearing your songs sung by big audiences for the first time? Darrell: Hearing people sing my songs everywhere I went was a surprise and a great encouragement. I couldn't believe that they knew them already. I had just started. Ministries like Teen Mania took my song all over the world before they were ever published or recorded by me. They had some songs in their early songbooks that said "Author Anonymous." Some of those were songs I wrote that I still haven't recorded yet. Darrell Evans's new album Awesome God Is He is available now wherever music is sold!